Post-operative nausea and vomiting (PONV) can be one of the most distressing parts of the surgical journey. It affects approximately 20-30% patients within the first 24-48 hours post-surgery. The consequences of PONV can include increased anxiety for future surgical procedures, increased recovery time and hospital stay, and, in severe cases, aspiration pneumonia, incisional hernia or suture dehiscence, bleeding, oesophageal rupture, and metabolic alkalosis. There are a number of risk factors for PONV. They can be divided into patient factors, surgical factors, and anaesthetic factors. 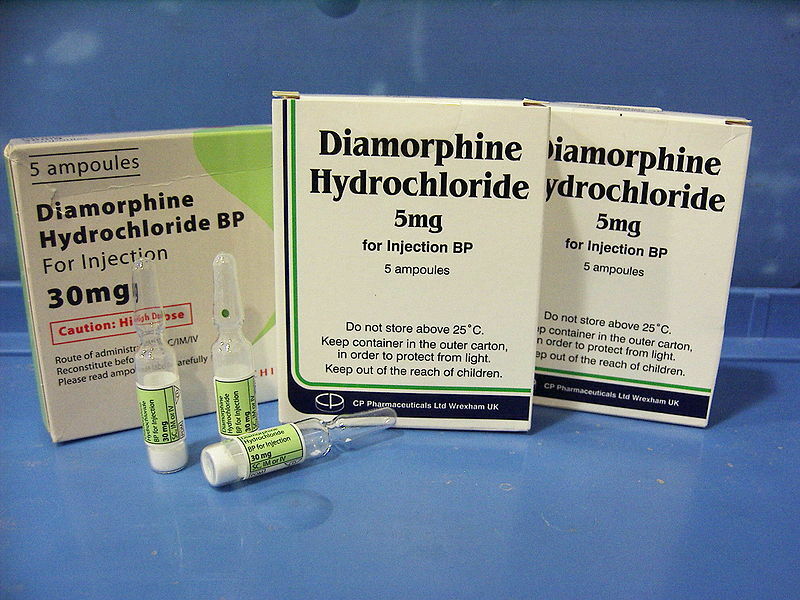 Figure 1 – Opioid analgesics, such as diamorphine hydrochloride, can induce nausea and vomiting. Vomiting centre – located within the lateral reticular formation of the medulla oblongata. It controls and coordinates the movements involved in vomiting. Chemoreceptor trigger zone – located in the area postrema (situated at the inferoposterior aspect of the 4th ventricle). It is located outside the blood brain barrier and can therefore respond to stimuli in the circulation. The vomiting centre receives input from the chemoreceptor trigger zone, gastro-intestinal tract, vestibular system and higher cortical structures (such as sight, smell and pain). If the stimuli are sufficient, it acts on the diaphragm, stomach and abdominal musculature to initiate vomiting. 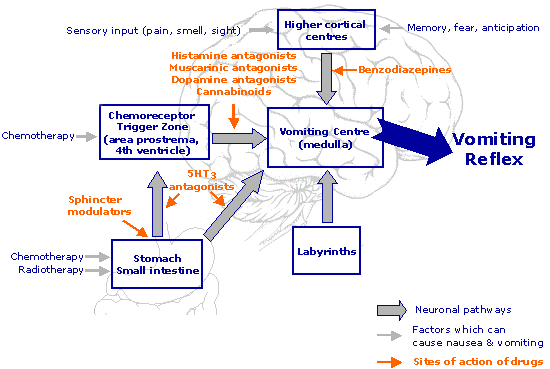 Figure 2 – The pathways and neurotransmitters involved in the control of vomiting. When assessing a patient suffering with PONV, the first priority is to ensure that they are safe and stable. If in any doubt, an ABCDE approach should be taken. If the patient is drowsy and/or vomiting there is a risk of aspiration, so careful airway assessment and protection with the use of an NG tube may be required. What was the operation? Is it likely to cause PONV? Which anaesthetic agents/post operative drugs have been used? Are there other factors contributing to nausea? Which antiemetic therapy would suit this patient best? 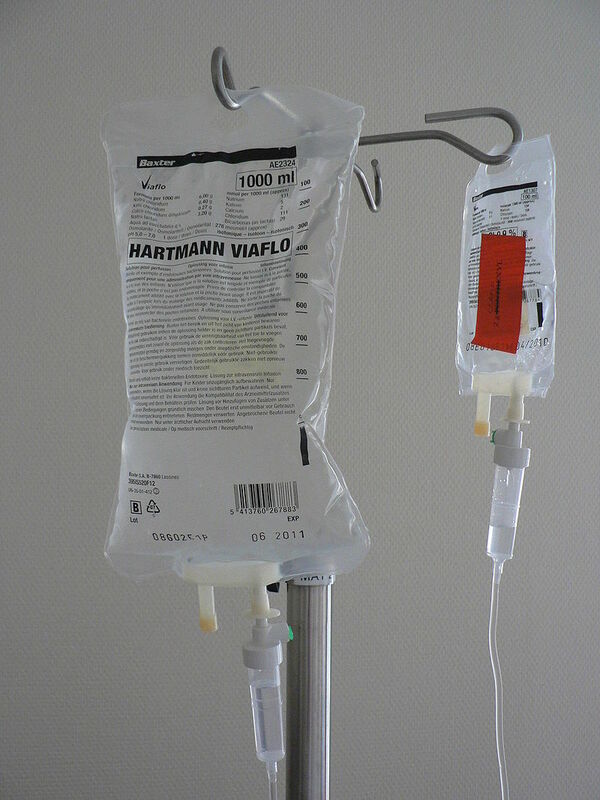 In addition, it is important to be aware of alternative causes of nausea and vomiting in the post-operative patient, such as infection, gastrointestinal causes (post-operative ileus, bowel obstruction), metabolic causes (hypercalcaemia, uraemia, DKA), medication (antibiotics, opioids), CNS causes (raised ICP), or psychiatric causes (anxiety). These should all be managed as necessary. The management of post-operative nausea and vomiting can be divided into three areas; prophylactic, conservative and pharmaceutical. A wide variety of pharmacological options are available for anti-emetic action and it is important that the choice of antiemetic is considered by the likely cause of the nausea. Multimodal therapy is often more effective, therefore add in a different antiemetic to that given in theatre. Hyoscine (an anti-muscarinic) can help to reduce secretions and subsequent N&V in patients with bowel obstruction. Any higher cortical input, as previously discussed, should be treated appropriately, so ensure patient is well-hydrated, any pain is well controlled, and anxiety is treated appropriately. Identifying patients who are at risk of PONV will aid in their management. Prophylactic measure includes anaesthetic approaches, conservative measure and prophylaxis. A range of antiemetic medications are available and are often used in combination. Nausea and vomiting may be a sign of post-operative complication like bleeding or ileus. Consider these carefully in the assessment of these patients. Which two areas of the brainstem have a role in the control of vomiting? Which ventricle of the brain does the chemoreceptor trigger zone lie in? What is the most appropriate management of a patient with PONV? Which of the following is NOT a patient factor that pre-disposes to PONV?